3 Bedroomed cosy cottage. Sleeps 4 adults plus baby, plus well behaved dog/s. Newly decorated and improved for 2019, Milton Oak Cottage provides peace, comfort and relaxation in delightful, rural surroundings. It is located in a quiet, country lane, yet not isolated, in central Pembrokeshire. 4 Star rating with Wales Tourist Board. Modern fully equipped kitchen, with atmospheric mood lightening and dining area for 6. Master bedroom has king sized bed and TV. The two single bedrooms also have TVs and views over surrounding countryside. French doors open onto the sunny, south facing private patio, from a cosy sitting room. More than one dog/s are welcome, at no extra charge, but must be well behaved and kept on leads in the grounds, (except the enclosed patio). All beaches, coastal walks, castles and places of interest are within a short drive away For those who want to relax and soak up the sunshine and perfect quietness, or stay warm indoors on cold or rainy days, this cosy, clean cottage will cater for all needs. Parking for 2 cars, in front of the cottage. It is an ideal base for energetic families who want to visit the beaches, castles or theme parks, whilst the keen walkers and dog owners can enjoy the miles of fabulous coastal path as well as numerous walks from its door. For the historians, there is a WW2 Pillbox in lane opposite to cottage. Cyclists can join the Brunel cycleway 1 mile from the cottage or explore the many cycle routes in the area and secure their bikes at the cottage. Plenty of local tourist information leaflets and maps available, plus games, books and DVDs. Sleeps 4 adults plus baby, plus well behaved dog/s. Owners next door in property semi detached to cottage. Barry and Christine moved to Pembrokeshire in 2000 with their 2 children and 2 cats. They found their perfect home, surrounded by beautiful rural countryside, yet near all beaches and areas of Pembrokeshire. They settled at once and decided to transform the cottage next door from a very basic dwelling, into a cottage for their families and friends to stay in when visiting. Everyone was so enthusiastic about it, that they were encouraged to further upgrade it into a superb 4 star holiday cottage, so that tourists can stay and discover this beautiful part of Wales. From the wonderful comments left by the guests in the visitors book, they made the right choice and welcome all holiday makers, their families and dogs. Bath with electric shower over, wash hand basin and Toilet. Heated towel rail. Airing cupboard. All beaches within 20 - 30 minute drive away. Very rural location set in extremely quiet rural location within reach of numerous countryside walks, lakeside walk and Neyland marina/Cleddau waterway. Neyland waterfront and marina 10 minute drive away. Westfield pill nature reserve and lake 10 minutes walk away. Flat screen TV with Freeview, DVD and Radio/CD player. 2 comfortable sofas / coffee table. Books and DVDs available.owner French windows open on to south facing rear patio. Toddler play table with 2 toddler chairs. Fully equipped kitchen. Cooker with extractor fan, freezer, fridge/freezer, microwave, dishwasher and automatic washing machine. Child/toddler plates/bowls/cups. Tumble drier. Table and 6 chairs plus highchair. Radio, CD and internet radio. DVD player and assortment of DVDs. Plenty of books to chose from to suit all tastes. An assortment of games, puzzles and card games. A small selection of CDs provided. Box of toys and toddler table/chairs. Picnic table on front lawn and small monkey swing for children. Front lawn not enclosed. Patio enclosed with small garden gate. WW2 Pillbox across road from cottage. Bicycles not provided, but one outdoor bike rack set in concrete which can secure a bike on each side. Rosemarket or Freystrop golf courses within 3 miles, but many more,..see "golf courses in Pembrokeshire" website. 'Heatherton' Activity centre offers golf and crazy golf - see website. Christine and Barry were great hosts all the way, giving us information about the area and always ready to help. Although they live in the house attached, we rarely saw them and we felt like we were there on our own. We found some fresh eggs and a bottle of wine at our arrival, what a pleasant surprise! The cottage is close to many interesting coastal towns and beaches, and a great base to explore the beautiful Pembroke area. We had an amazing time. The property was clean and had everything we needed. Chris and Barry were excellent and very approachable. The property was in an excellent position. Couldn’t have asked for more. We had a really relaxing couple of days here. Very comfortable and cosy and we were very lucky with the weather. Great location to some fantastic beaches. The welcome package was very much appreciated and our dog loved his treats. Thank you for a great stay. We will be recommending to others. Beautifully appointed cottage! A real home from home experience - spotlessly clean! We thoroughly enjoyed staying at Milton Oak Cottage. We especially appreciated the welcome pack & the fact that there was something in it for the dog as well. 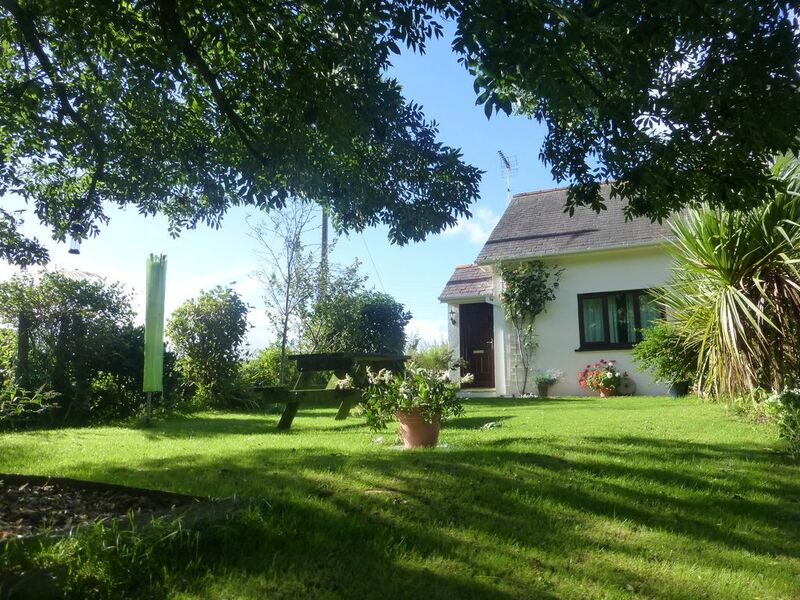 We loved the peacefulness & tranquility of the setting& the fact that the cottage was centrally placed near Haverfordwest to explore the countryside & beaches all around. Great experience all round & Barry & Chris were very welcoming. Would make a couple of points, however. The settees in the lounge were not the most comfortable & might have benefited from plumper cushions. We also felt the duvets were rather warm considering the time of year & perhaps lighter bedding would have suited us better. These are minor points & did not detract in any way from us having a thoroughly pleasant stay. Thank you Barry & Chris! What a lovely place, a delightful cottage with absolutely everything you might need! The owners were very welcoming, hospitable and helpful. We really enjoyed the walks with our dog and visiting all the beautiful beaches of Pembrokeshire. What a lovely welcome to find a gift of wine, chocolates and fresh eggs - and some delicious potatoes later in the week! A great place to stay, thoroughly recommended. You will be spoilt for choice in beautiful beaches in Pembrokeshire and miles of cliff walks on the coastal paths. Approximately 10 miles drive are the popular towns of Tenby and Saundersfoot both with pretty Harbours and long sandy beaches. In the other direction is Milford Haven, a working Port, with pleasure boats in the marina. Stackpole estate and Bosherton lily ponds are picturesque National Trust locations. Surfing is fabulous at Freshwater West, Newgale and Whitesands to name but a few. There is a WW2 Pillbox across the lane from the cottage, although access is awkward. If you fancy a visit to the Emerald Isle (Ireland) the ferry terminal is at Pembroke Dock, which is approximately 4 miles back over the Cleddau Bridge. The trip takes a little over four hours on the Ferry. Travel Cardiff Airport - 103.8 miles and takes 2 hrs and 20 mins approx. Pembroke dock Train Station - This is approximately four miles away, Taxis waiting on train arrivals. M4 Cardiff - 88.5 miles, 1 hr 55 mins. The property is approximately a mile from the picturesque hamlet of Burton, with The Jolly Sailor pub serving good food. Haverfordwest - 8.6 miles, 21mins, with most of the supermarkets, and many other high street shops, small cinema, castle. Tenby Approx 30 mins drive. Carmarthen - 34.6 miles, 55 mins, Shopping Centre and supermarkets, cinema. Pembroke Dock - 4.4 miles, 12 mins, Tescos, small high street shopping and small Asda. Ferry Terminal for Ireland. Well behaved dog/s are welcome free of charge.